Husbands Bosworth National School was opened in 1865. This picture was taken in about 1880 before the school yard was fenced in. The land for the school was donated to the village by the Turville family of Bosworth Hall. The Headmaster's house is to the right of the building, with the Infant's Classroom, newly added, on the left. 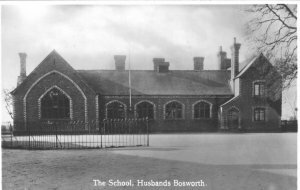 For more historical information about Husbands Bosworth School and education in Bosworth please click here. Follow this link to the Husbands Bosworth C of E Primary School official website.